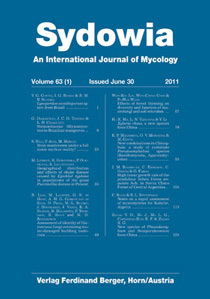 Zhang Y. D., Ma J., Ma L. G., Castañeda-Ruíz R. F. & Zhang X. G. (2011) New species of Phaeodactylium and Neosporidesmium from China. Phaeodactylium cephalotaxi sp. nov. and Neosporidesmium micheliae sp. nov., found on dead branches of Cephalotaxus fortunei and Michelia maudiae, respectively, from the tropical forests of China, are described and illustrated. The former species is characterized by narrowly ellipsoidal to clavate, 2-septate conidia and the latter is distinguished by the scattered synnemata and obclavate conidia with 7–8-euseptate.